Its been so long since I posted on this blog. Lots of reasons, weather, life and what not.Somehow I decided to break the silence today! Why? To write about Bok choy. Bok choy is a vegetable that belongs to the Cabbage family. 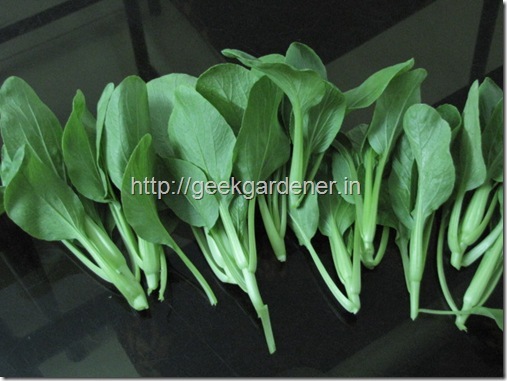 It is an exotic vegetable which is getting more popular in India lately. Since it is an exotic vegetable and not available in the market quite easily, the only way to get it fresh is to grow it yourself. That’s not the only reason I grew. Story time.. It was my marriage anniversary. Me and wifey decided to go out for a dinner and the onus was on me to choose some place “nice”. I choose the restaurant and we get in. I run through the menu to choose and I see this Stir fry with bok choy, zucchini, mushroom, etc, etc. Somehow this gardening hobby makes you pay close attention to what the menu contains.. anyways..The item was priced like crazy and the rest of dishes weren’t so expensive. Looks like bok choy was the pricey one. I did order that dish ..That was enough to get me started on growing them. Gardening is so much fun when you grow stuff you don’t get outside when you want them. and in a months time, we had the veggie ready for harvest. So with the bok choy growing at home, there is stir fry now and then.. and of course without the heavy price tag. Now coming to the growing part. 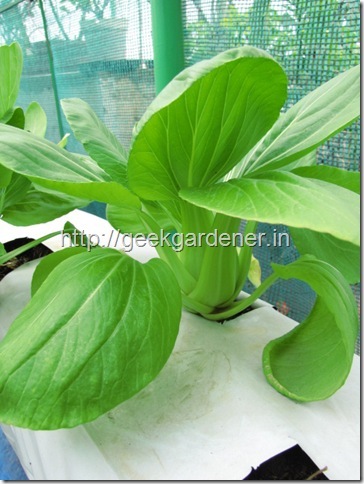 Bok choy is consumed for its leaf and swollen petiole. Growing bok choy is very easy. 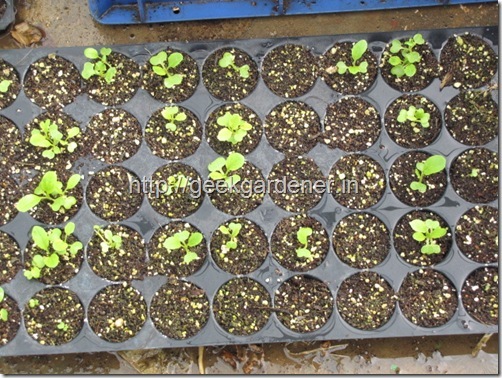 Like most Brassicas, it is propagated from seeds. The seeds look like mustard seeds and readily germinate in a weeks time. The seeds are sown in a seed starting mix made by using straight cocopeat or cocopeat and compost in equal proportions. The tray is filled with media and gently tapped to remove air pockets. Sow the seeds at the rate of 2 per cell and water it lightly. Then cover the tray with a polythene. Periodically check for new growth. In about 4 days they will start emerging. Once you see a sign of new growth, remove the polythene bag and keep the tray where it will get good sunlight. Bok choy can be planted in place that receives moderate sunlight. Though they prefer full sun, they do well in moderate light as well. Once germinated they should look like below. 14 May 2011 – 3 weeks old. Instead of thinning the seedlings to just one, I left them growing in the cell and harvested the first batch as part of thinning :-D.Here is how they looked 3 weeks later. 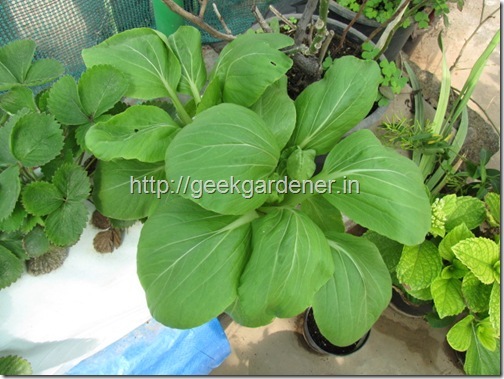 Bok choy can be either direct seeded or transplanted. In either case, leave 6-8 inches of space between plants. They can be easily grown in trays. Choose trays of depth 6-8inches. I transplanted them wherever I could find space in my garden. 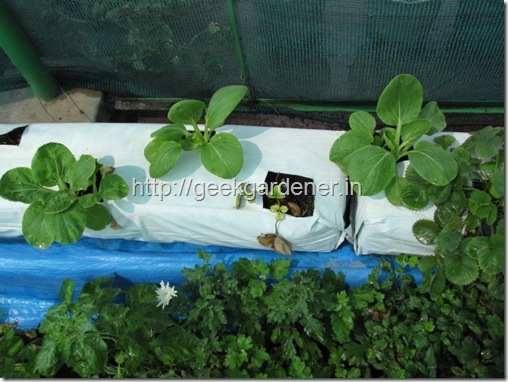 Few in pots, in grow bags and in Hydroponic NFT systems( More about this later). It can be growing in soil/soilless mix. For soil, use a mix of red soil, manure and cocopeat/sand in equal proportions. For soilless use a mix of cocopeat and compost 50-50 and for hydroponics, just cocopeat or water if using NFT/DFT. Bok choy is consumed as a leafy vegetable and it needs a good dose of nitrogen rich fertilizer for a good healthy growth. 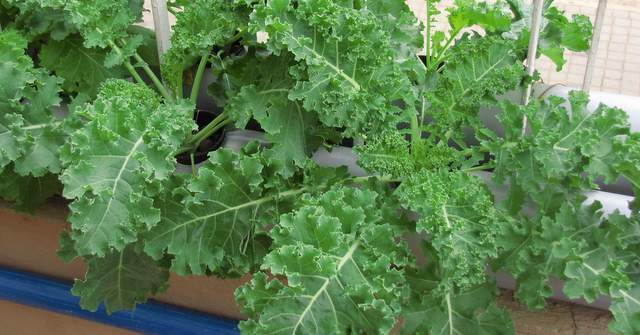 A fertilizer that has high nitrogen is recommended for healthy green leaves. Organic folks can use chicken manure/horse manure. These two manures are good source of nitrogen. 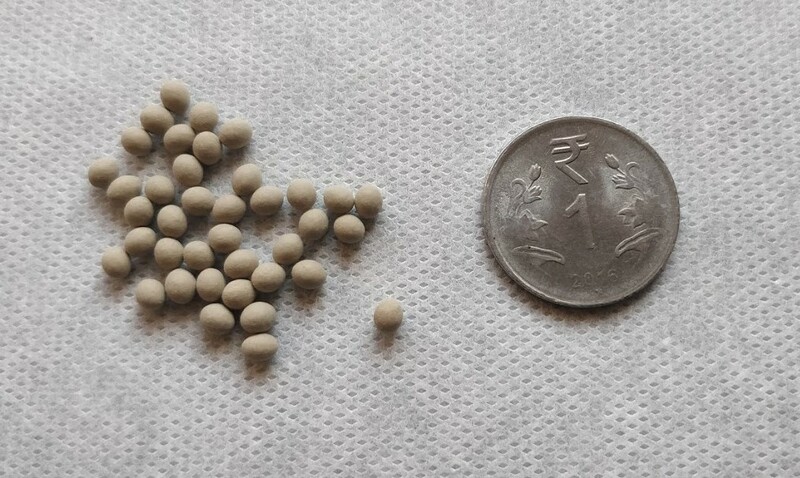 One can also use seed meals such as neem cake, pongamia cake etc as manures. These manures act as a fertilizer and repel pests as well. Bok choy comes to harvest pretty fast. They are ready for harvest just 40-45 days. Two ways of harvesting. You can either keep taking the leaves in the outer side or uproot the whole plant. Suit yourself. If you think the bok choy is only yours, think again. You got company!. Pests are common for bokchoy are aphids and mites. Both of them can be controlled by neem sprays. 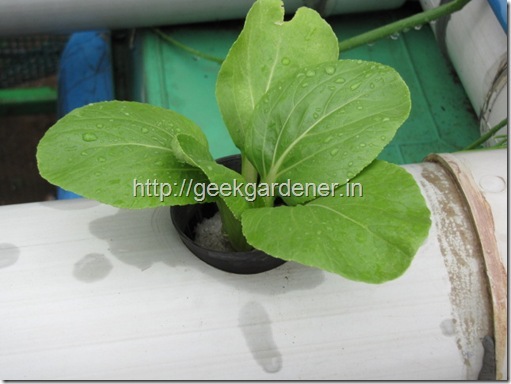 Plant marigold plants in between plants this will control mites to some extent. Remember, I hinted above about NFT/DFT. When I transplanted the seedlings, I planted some of them into the hydroponic NFT/DFT system I had setup sometime back. 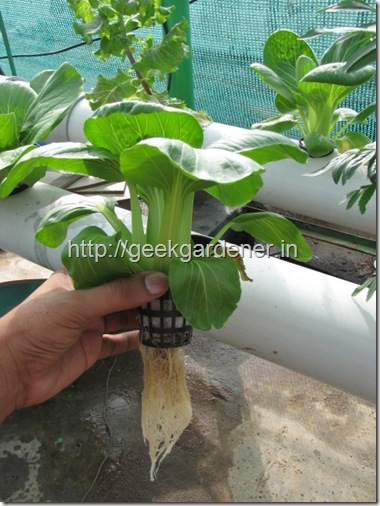 It uses PVC pipes with recirculating water to grow plants. The plants are held by netpots that sit on the holes made on top of the pipe. Nutrient solutions runs continuously in the pipe. I planted it on May 25th. In just about 2 weeks time from transplanting into the hydroponics setup, the plant has grown very well . The nutrient solution has worked wonders and you can see the effect on healthy leaves. It is almost ready for harvest. Since the medium is water for this plant, they roots grow into the water that is circulating. Good white roots are sigh of healthy plant. You can see the roots coming out the netpot. Behind is the setup. From seed to plate, here is bok choy in all its glory.It is better to harvest and use it immediately else it looses its crispiness. That was fun isn’t it? Can you tell me what is Nutrient mix you used for NFT system. Awesome as all other success stories of yours 🙂 I am posting your blog’s URL to the FB group of gardeners/garden lovers. Thank you so much for sharing it with your group. I really appreciate it. Thanks for writing to me. I am so happy to hear that horticulturists like you are visiting this site. Yes I have grown cherry tomatoes too :). U mentioned about growbag.What does your grow bag contains?How do we make it? Grow bags are bags that contain growing media. Cocopeat in my case. You can buy or make if you have the polybag of the required size. Hi GG, Thanks for this post.Your blog is very inspiring and I would like to grow this. I remember eating this in Singapore and enjoyed the flavour. How can I get the seeds? Thanks for the comment. I can send you the seeds. I have sent a PM to you. 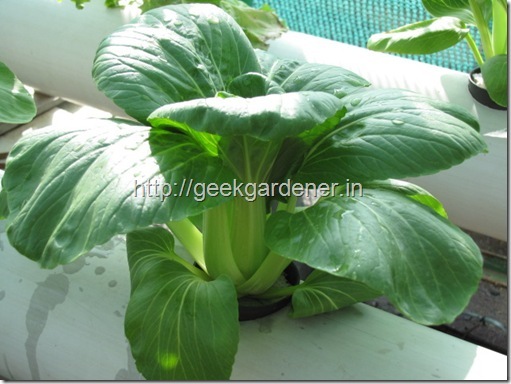 Wonderful post after a long time..bok choys look awesome. Now i am waiting for the NFT post, looks great! I am trying my best to get the post out at the earliest. I never knew that there is a vegetable called Boy Choy. Where can I get the seeds please? 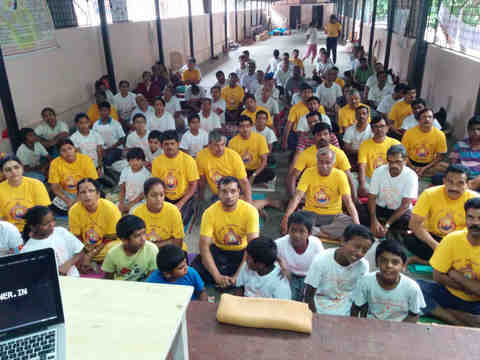 I also want to buy some panchagavya from your place. Which would be a convenient time and day please? GG, That’s a lot of Bok Choy you’re growing. You could supply a restaurant! My neighbour grows Bok Choy too and she’s had it for ages now. It just keeps growing back, like spinach. Thanks for all the details on how best to grow it. I will have to try this now. I just hope I get the seeds here in Chennai. If you don’t get the seeds, let me know admin@geekgardener.in. I can send you some seeds and you can pay by bank transfer. Great post! You detail the process so well and inspire those in small spaces to grow their own food. Bravo! 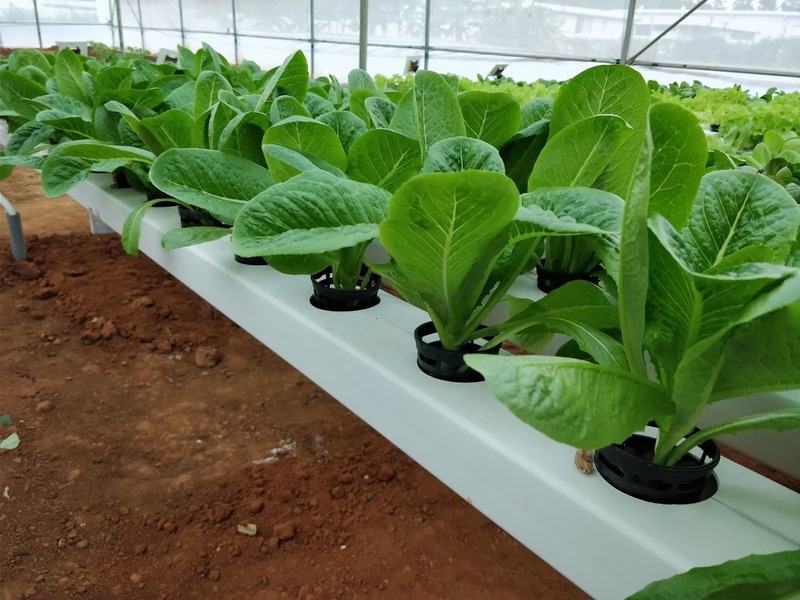 I missed out the last paragraph and raised a request in forum to describe about the Hydroponics setup for DFT/NFT. We are eagerly waiting for that. Also I am quite impressed about Boy Choy growing in your garden. Waiting for your post on the setup. The post is in progress. Thanks for showing interest. I will try to get it out at the earliest. Where do you source cocopeat from and how much does it cost? What about mannure? I buy cocopeat+mannure bags from the Osborne road guy and he’s turning out to be extremly expensive. Any place near Marthahalli I can get cocopeat from? I stay near Kundanahalli gate and there are 3 big nurseries there but they just have plants which are not very healthy and no cocopeat. How you doing, long time eh? Loved ur latest post. My garden is coming along well thanks to you. Well i need seeds to. So PM me as well. The european cucumbers plants are flowering and fruiting like crazy, but unfortunately I have aphids on them and helplessly seeing them destry leaf after leaf and new shoots. One of the plant is almost died. Please help me kill these sap sucking suckers. I have seen some articles about soap spray. I am sure u have got rid of aphids once before. I dont know which soap to use, how much to use. Please help . SOS. This is wonderful GG, The plants in the NFT look like the one on the cover of ‘How-To Hydroponics’ book. What is holding the plant in the netpot? You are totally right. Infact that pic in How to hydroponics was an inspiration to try Bok choi in NFT. The setup is like this.. I took a netpot, and made a hole in the bottom centre such that a main root can enter. Then I wrap the plant root with styrofoam and let it sit in. This had both its +s and -s..
Beautiful! Thanks for the elaborate article; helpful. 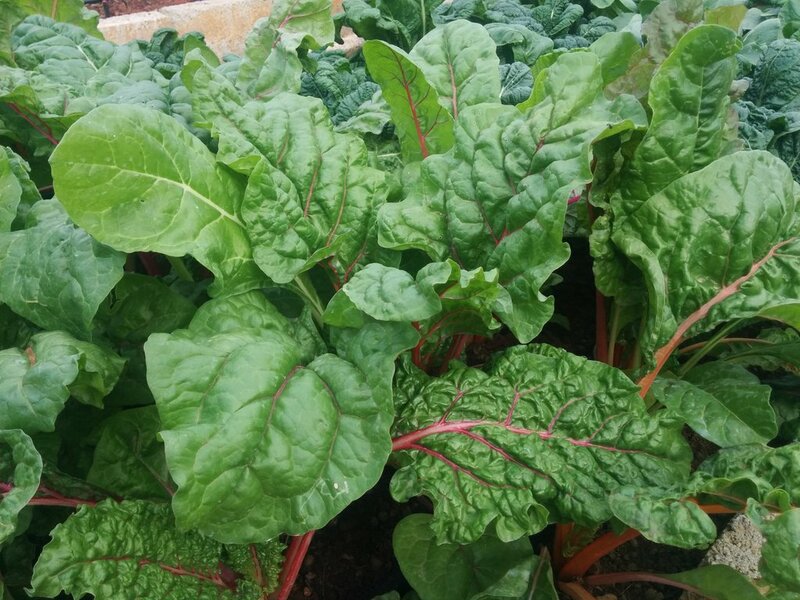 I’m a regular reader of your website .your website helped me a lot for my own gardening ,thanks for creating a wonderful website ,i have a question ,i live in kolkata so bokchoy,can it be grown here??? Bok choy can be grown there. If the temperature increases, it might start flowering. The key is to harvest it little earlier. Can you give details on material in grow bags. How do you mix cocopeat and in what proportions. Do the grow bags need holes for drainage.Have limited space so I trying to grow in all areas. Thanks for any info. I left a message for you on the Contact Us page as well. I am looking for some Bok Choy seedling pods or seeds for my kitchen garden. I am based in Bangalore (near Hebbal). My contact number is 0-99017-55944. Please do let me know on this. Thank you. I had left a comment yesterday morning and was shown as “Awaiting for moderation” until last night. However, I don’t see my comment now. I am not sure if the comment has been deleted or has been lost. I had a query if you have Bok Choy seedling pods or seeds, which I plan to use in my kitchen garden. I do hope to hear from you. Im interested in doing Hydroponics. And I plan to plant bok choy. Can I get seeds from you? speaking of transplant, can you grow Bok Choy from those that you get from the supermarket? Read your article and i feel i got answers to all my gardening queries.I love bok choy, lettuce,brocolli and celery.But the issue is i stay in Raipur,chattisgarh. Pls guide me how can i grow these plants out here.Raipur has hot climate but winters are nice over here.I need your guidance. Pls send me how to plant lettuce especially. I read with interest your thought provoking article on Bok Choy. Can i grow it in chennai. Please let me know how i can get the seeds. Will you send it to me. I came to know about your blog from the Hindu proprtyplus dated Jan 7.Though i dont have a full fledged garden I intend to start one. I want to try bok choy since it will help diabatics like I and my wife. I have book marked your site and I will go thrugh it regularly. where will we get the seed? Today for the first time I visited your site and already I have read through many posts of yours. I thank you for sharing your ideas, experiments and making it available in the public domain for many other to benefit from. I have one question to start with did you try a seed to see experiment on bok choy, or always you purchase seeds? can you write some post on seed to seed experiment. I live in Dubai…what should the outside temperature be when sowing bok choy? That looks more like Pak Choy (baby bok) than the taller-w/white-stalks Bok Choy. Very much impressed. Is there a place for me to learn everything practically. Please help especially in orchid tissue culture. Thanks a million. 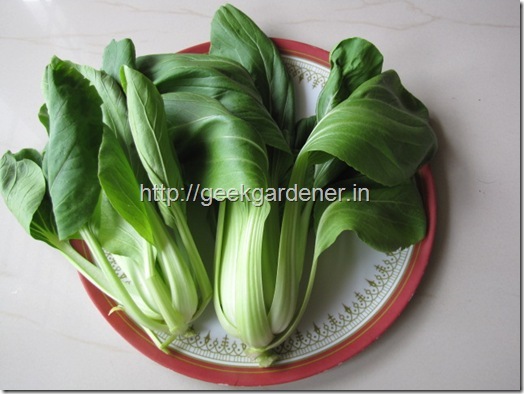 Hi,im from bangalore and i want the seeds for bok choy.where can i get them. I have started growing book chop in my garden.Planted them about 2 weeks ago and are doing well.